AfterDawn > News > Sony to unveil Xperia Z at CES? Sony to unveil Xperia Z at CES? According to ePrice, Sony will unveil their new Xperia Z flagship at CES in two weeks. 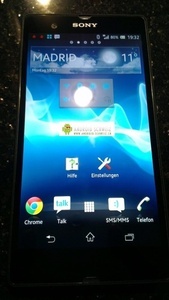 The phone will feature a quad-core processor, a 5-inch screen and 1080p resolution. Rumors of a 1080p Sony device have been around for months, as the company hopes to compete with the latest from HTC, LG and even Motorola. Fully dubbed the Xperia Z L36H, the phone will also allegedly feature a 13MP rear camera, the Snapdragon S4 processor and an Adreno 320 GPU for smooth gameplay. Furthermore, the device will include 2GB of RAM and a microSD slot, a feature not seen on Google's latest Nexus. The source also states that Sony will make the phone available on January 15th, just one week after the CES keynote. Watch that on your HDTV!